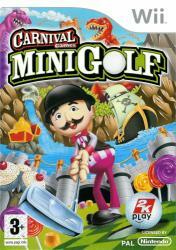 You may have played golf before but you�ve never played anything like Carnival Games MiniGolf! Up to 4 players can hit the links on over 25 larger-than-life, theme park style holes. If you�re ready to journey back to Medieval times, shoot out in the Wild West and walk the plank in Pirate�s Delight - all for the sake of sinking a putt - then welcome to Carnival Games MiniGolf!